Ambulatory Care Pharmacy addresses the provision of integrated, accessible healthcare services for ambulatory patients in a wide variety of settings, including community pharmacies, clinics and physician offices. Currently there are more than 3,800 BPS Board Certified Ambulatory Care Pharmacists. 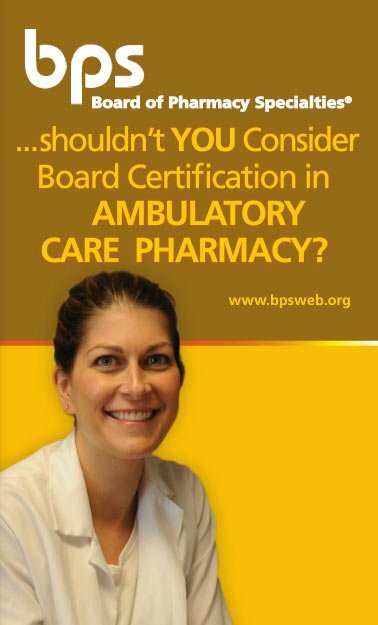 The BPS Board Certified Ambulatory Care Pharmacist (BCACP) Program is a credential for pharmacists who have met the eligibility criteria below and provide integrated, accessible healthcare services for ambulatory patients in a wide variety of settings, including community pharmacies, clinics and physician offices. The BCACP provides patient care, develops sustained partnerships with ambulatory patients and other healthcare providers in the context of family and community; and integrates care of both acute illnesses and chronic conditions. Educating and engaging patients in health promotion and wellness. Achieving a passing score on the Ambulatory Care Specialty Certification Examination. Refer to the Ambulatory Care Pharmacy Content Outline for details. Earning 100 hours of continuing education credit provided by the professional development programs offered by the American College of Clinical Pharmacy (ACCP) and/or the American Society of Health-System Pharmacists (ASHP) and/or the American Pharmacists Association (APhA). Please note, the Ambulatory Care Pharmacy Preparatory Review and Recertification Courses offered by either of the approved providers may only be completed for recertification credit up to two times, in nonconsecutive years, during the 7-year recertification cycle. **To achieve the 100 hour requirement, the BCACP may participate in recertification offerings from both BPS-approved ambulatory care pharmacy providers. Board Certified Ambulatory Care Pharmacists® are also required to pay the BPS Annual Certification Maintenance fee of $125 each year for years one through six and a $400 recertification fee in year seven. Ambulatory Care Pharmacy addresses the provision of integrated, accessible healthcare services of ambulatory patients transitioning from the hospital to home or another care facility. Currently there are more than 3,800 BPS Board Certified Ambulatory Care Pharmacists. Has the advanced knowledge and expertise to focus on the special needs of patients who may have concurrent illnesses taking multiple medications, and who often administer these drugs themselves or with the assistance of a caregiver at home. Achieve a passing score on the BPS Ambulatory Care Pharmacy Certification Examination. Achieving a passing score on the BPS Ambulatory Care Pharmacy Recertification Examination.